My Mom has been making this chex mix for as long as I can remember. She usually only made it a few times a year, but one of those times was always on New Year's Eve. It makes a ton, so it's great to take to a party. Friday night, I got home from work, put on my comfortable clothes and was ready to relax for the night, when my hubby really really wanted some of this chex mix. So, we headed to the store to buy the cereal. I usually have most of the other ingredients on hand. By the way, what is up with cereal? The boxes are getting smaller and the prices are getting higher, same thing that I complain about with chips. What they call "Party-Size" is pretty much what regular-size used to be. Anyway, my Mom's recipe calls for a 1/2 a box of golden grahams, but since cereal box sizes are completely different than they used to be, we had to decide how much was the perfect amount. Within a few minutes of getting home from the store, we had a big bowl of this super addicting, BEST EVER, chex mix finished and ready to eat. When I say it's addicting, it totally is. Once you start eating it, it's so hard to stop. The flavor and texture are so satisfying. 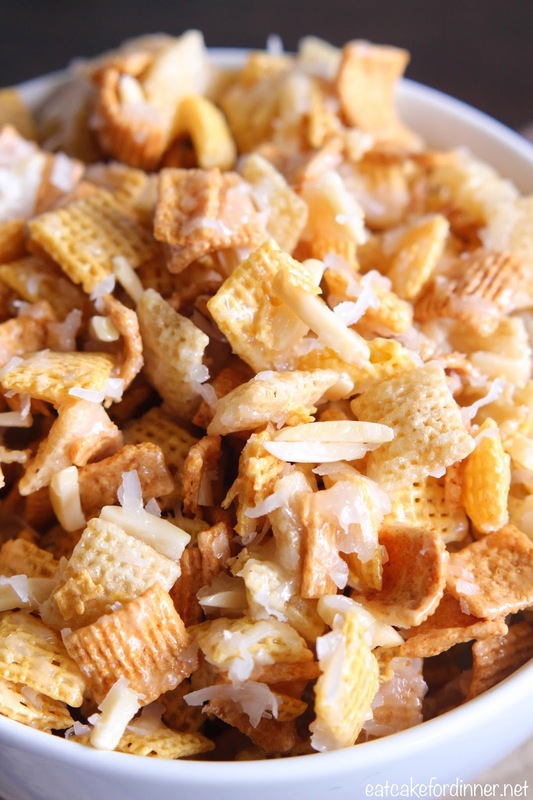 Everything you want in texture, is in this chex mix . . . crunchy, creamy and chewy all at the same time. This is guaranteed to become a family favorite. 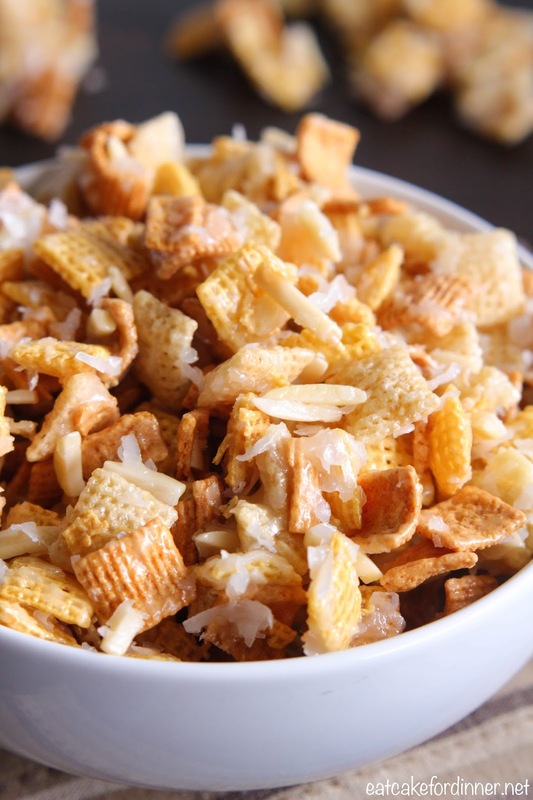 In a very large bowl (at least 32-cup size), toss together the Corn Chex, Rice Chex, Golden Grahams, slivered almonds and coconut; set aside. In a medium saucepan, melt the butter. Add the Karo syrup and sugar and stir until combined. Heat over medium heat and bring to a boil, then boil for two minutes, stirring constantly. Remove from heat and immediately pour over the ingredients in the bowl. Carefully stir together until everything is evenly coated. Allow to cool and serve. 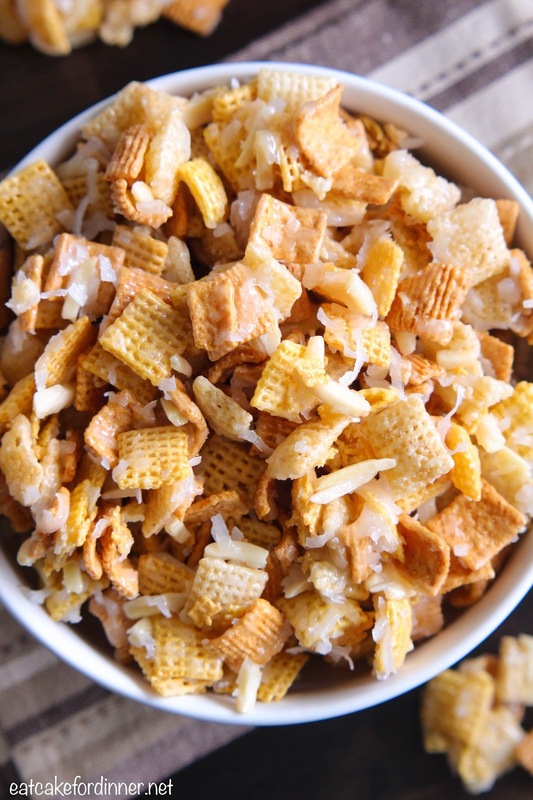 I think my Friday needs a big bowl of this chex mix! Love the coconut almond combo! So pretty, I have to make this! Would this be good in gift jars? Or does it need to be served right away? It is a sticky chex mix and you could give it as a gift in jars, but I would eat it within 3-4 days.